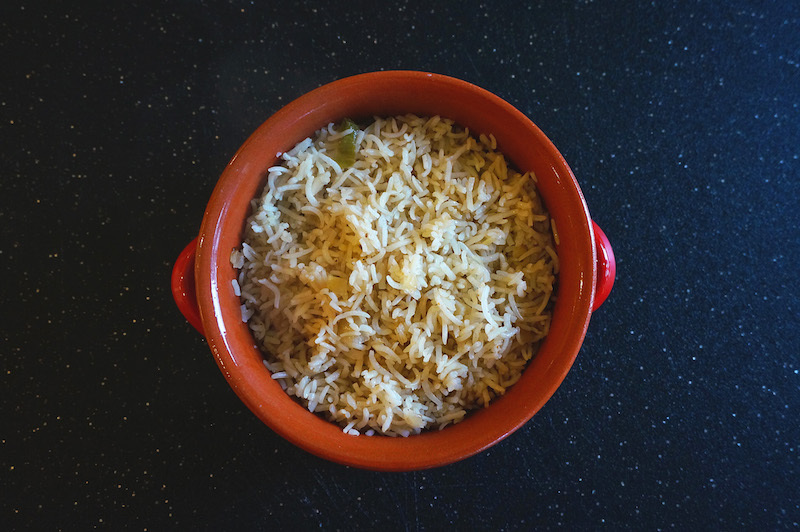 This lightly Spiced Basmati Rice makes an excellent accompaniment to any vegetable dishes, curries, and meat. I usually serve it with fry okra, and dhal. Rinse the Basmati rice and soak in cold water for about 30 to 40 minutes. Drain well. Heat oil in a large pot over medium heat, and add the chopped onion. Cook until the onion soften with some brown bits. Then add green chilies, garlic, garam masala, and sea salt. Stir until fragrant and toss in the rice. Cook the rice with all the spices for about 3 to 4 minutes. Add the chicken stock, and bring it to a boil. Then reduce the heat to low and cover the pot with a lid, and cook for about 25 minutes. When the rice is ready, fluff with a spoon or ladle. Serve warm.